Perspective hit me with a 2 X 4 today at church when we saw a casual friend who just had her 5th child. She was in tears when she saw Brooke. I found out later that her family was having trouble making ends meet and living with her in-laws. I cannot imagine how uncomfortable and frustrating that must be. Our discomfort was diminished in that moment. We as Americans thrive on being comfortable. We set the thermostat at 70, we buy nice safe cars, we stay at our nice homes to watch a lot of movies and we drive to our churches without being shot at (hopefully). We have medication for just about everything in life to make us more “comfortable.” For the past few years there has been a war on this so-called financial group, the “one percent”. What amuses me is that even those who are complaining about the one percent are the one percent of the world. They just don’t look close enough in the mirror to see it. You who are reading this are part of the one percent so deal with it. I have read about several POWs who were forced to endure years of living in cramped conditions only to brought out to be beaten. Watch the movie, Amistad (1997) and you’ll get a glimpse of what it was like as a slave being transported to the new world. Go visit any third world country and you’ll see dozens of people living in space smaller than your apartment. I’m tired of complaining and I’m sorry for you having to hear it. Why do we complain when something doesn’t feel just right? Why do we complain so much about not having things just the way we want them? Why? We are discomfortably numb about life. I believe that God calls us to a hard life as Jesus commanded his disciples. It is harder for some more than others but in this discomfort God shows up. God calls us to discomfort to gain perspective and recognize the possibilities of life. When we fully understand this perspective, we are awake to God’s work in us and we can move forward. The next time I catch myself complaining about things, I pray for the courage to embrace this discomfort. How has God taught you through the hard times? 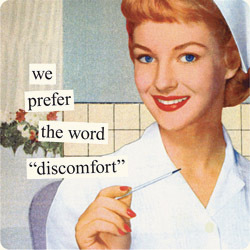 Through the discomfort? I think we all know that. But we still do it for some reason. Why? History is against us and we can sit and complain about what happened in the Garden of Eden all day long. Still today, pride and envy plague the best of us because we’re human. It has the ability to overcome us and bring the worst out of us. My latest bout with gloating was more in my head. It had to do with the confusion on why Albert Pujols is playing so poorly with his new team, the Los Angeles Angels of Anaheim. 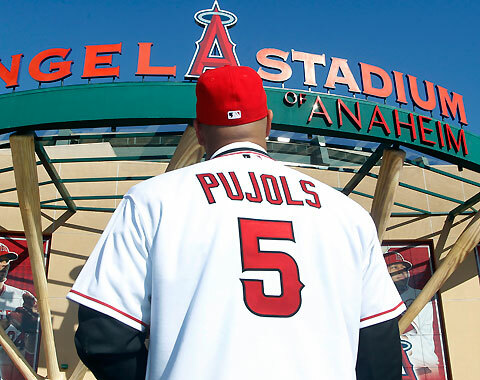 As a die-hard St. Louis Cardinals fan, I wish so many great things for Albert Pujols. He gave us so much and I wish he would have stayed in St. Louis. I wish the negotiations last fall would have gone better. Oh I just wished he would have just come out and said that the decision to leave was complicated and it involved so many factors that only he, his family, and God knew. As of today Albert Pujols is batting .197 with only 1 homer after over a month of play in a new uniform with a near record 10-year contract. His performance thus far is hardly the impact compared to his previous 11 years batting well over.300 and belting 30-40 homers a year. As a Cardinals fan, he has made it quite easy to gloat especially since his team is in last place and St. Louis is in first. Even though I wasn’t openly laughing about Albert Pujols, in my heart I certainly was. I’ve made my peace knowing that the Cardinals will move on and of course be fine. Albert Pujols is by far one of the greatest players of our generation and he’ll get his game back in due time and hopefully make an impact for his new team. I pray more that he’ll continue to embrace humility in this time to ultimately give more and more glory to Christ for why he is where he is. After all, his faith made as much of a headline as did his bat. If you are holding that grudge, let it go. If you have an inner smile when someone you don’t like messes up, give it up. It will eat you up for years to come and you will never live free and wise to be the person God wants you to be. Thank God it didn’t end for Adam and Eve that fateful day because in God’s plan, Christ took on their sin. He took my sin. He took yours. Albert Pujols will forever be my reminder that God’s grace overcomes my gloating, my pride. Stop worrying about your “Albert Pujols” and open up your heart to God. When you do this, your ability to live free is glorious.